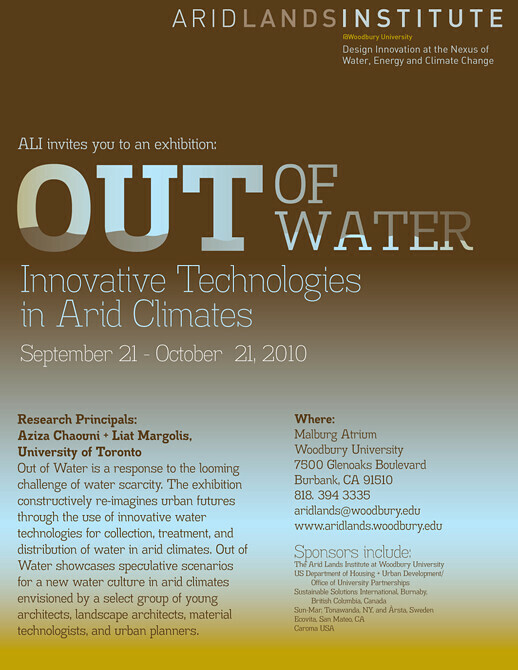 If I could go back in time, there are two things I would have prioritized this autumn, had I known about them earlier: 1) I would have stopped by the Out of Water: Innovative Technologies in Arid Climates exhibition, curated by Liat Margolis and Aziza Chouani, at the Arid Lands Institute of Woodbury University, and 2) I would have attended more of the accompanying lecture series. The whole thing sounds amazing. 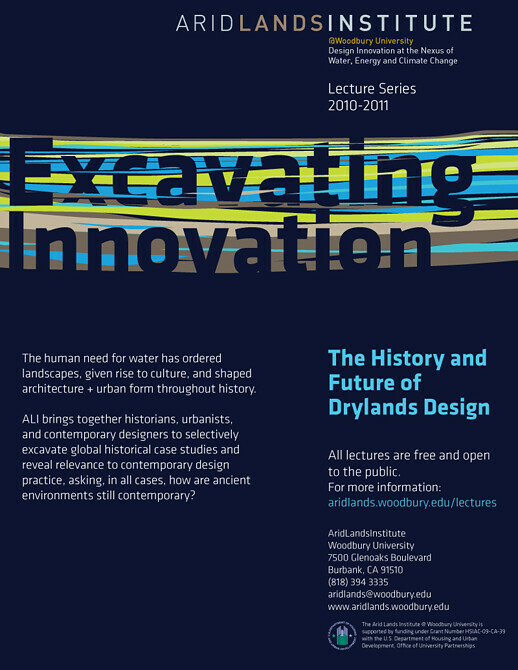 Excavating Innovation: The History and Future of Drylands Design examines the role of water engineering in shaping public space and city form, by using arid and semi-arid sites in India, the Middle East, the Mediterranean, and the New World to explore how dryland water systems throughout history have formed and been formed by ritual, hygiene, gender, technology, governance, markets, and, perhaps above all, power. 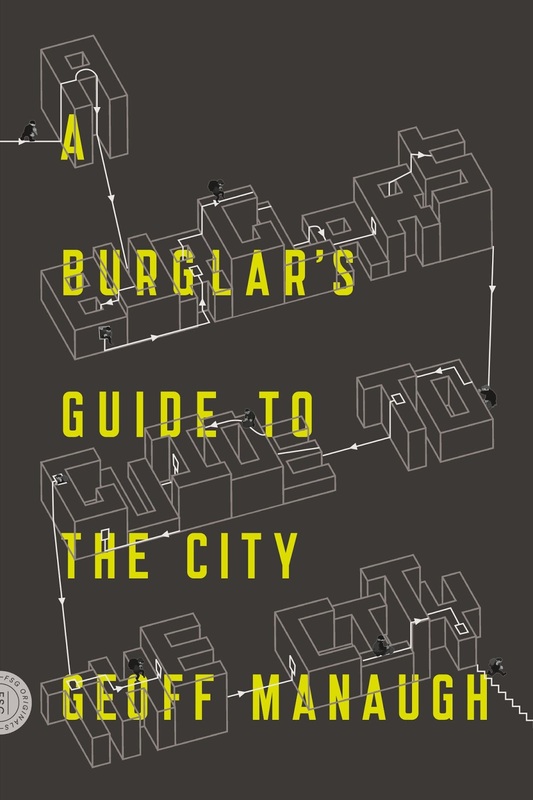 The series "brings together historians, urbanists, and contemporary designers to selectively excavate global historical case studies and reveal relevance to contemporary design practice." 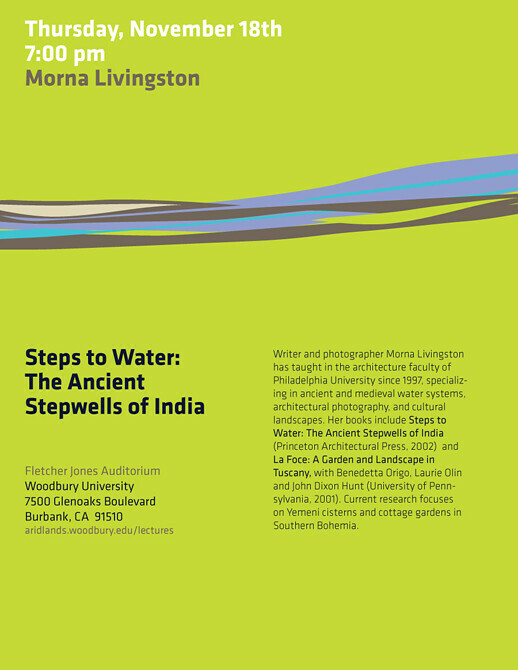 The specific lectures sound almost too good to be true, including a forthcoming talk this Thursday, November 18, about the stepwells of India—fantastically gorgeous native hydrological structures I've returned to again and again in my own off-blog reading and research. 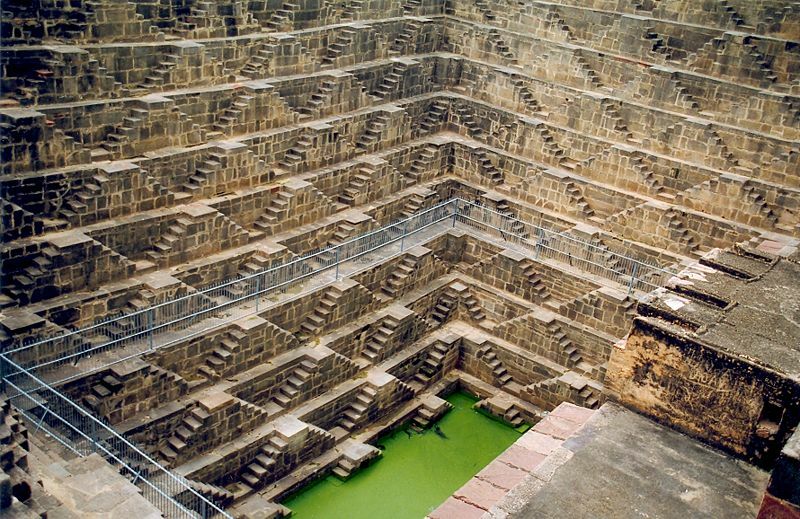 [Image: Stepwell at Chand Baori, courtesy of Wikipedia]. 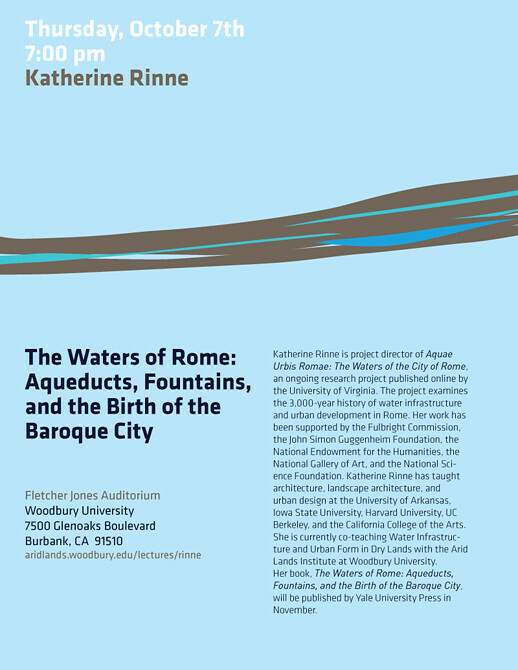 The series continues into 2011 with a lecture by Nan Ellin called "Canalscape: Ancient and Contemporary Infrastructures of Phoenix" (January 27) and one by Vinayak Bharne called "Indigenous Infrastructure and the Urban Water Crisis: Perspectives from Asia" (February 10). 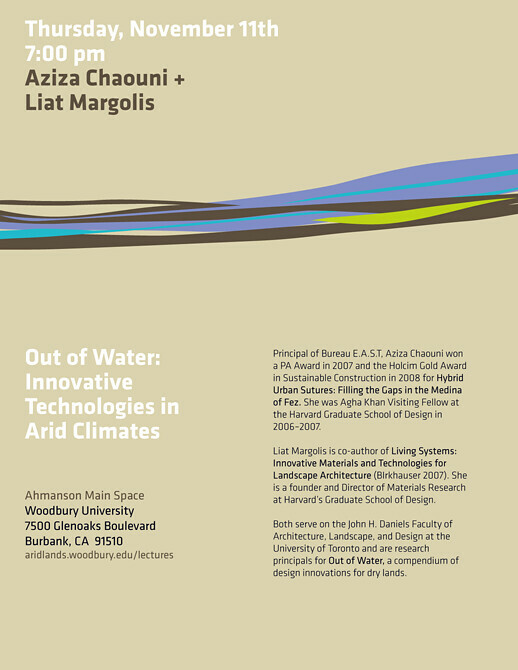 Anyone interested in the idea of "drylands design" or arid-climate technologies should strongly consider picking up a copy of Fred Pearce's excellent book When the Rivers Run Dry: Water, The Defining Crisis of the Twenty-first Century. 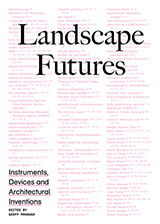 In it, Pearce presents a huge variety of vernacular water-harvesting and storage architectures, from Chinese domestic cisterns and dew ponds in the English South Downs to fog-catching nets in Pacific South America. Two other quick suggestions, if you want to extend your reading, include Marc Reisner's classic Cadillac Desert: The American West and Its Disappearing Water—an immensely interesting but often historically over-detailed book—and James Powell's Dead Pool: Lake Powell, Global Warming, and the Future of Water in the West. The latter title I favorably reviewed a while back for the The Wilson Quarterly. In fact, if you're really into this stuff, another article I frequently recommend here is something published in the Chicago Reader back in 2006: "They need it, we waste it," a provocative look at the future interstate politics of freshwater, projecting a time when cities like Phoenix, Las Vegas, and even L.A. might come, buckets in hand, begging for clean water from the Great Lakes. What impending hydro-political rearrangement of North America might we then see take shape? (Follow the Arid Land Institute on Twitter. Earlier on BLDGBLOG: N.A.W.A.P.A.). I just pulled out my copy of Formal Structures in Indian Architecture which has some incredible sections through the step wells. Especially Adalaj. When I was there a group of men were cutting replacement stones using their feet as clamp. gwall, I'd love to see those sections, if you have access to a scanner or digital camera. I feel a bit silly posting this, since it's more than likely that you and many readers will already have seen it, but Frank 'Strange Maps' Jacobs recently posted about John Wesley Powell's proposal for state borders drawn along watersheds, which is at least marginally related. 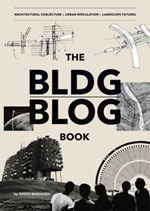 Great post and thanks for the vimeo link!